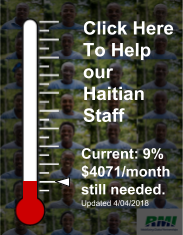 ​Our Haitian Staff Need YOUR Help! Would you please consider a monthly gift to specifically help our Haitian Staff? We feel so amazingly blessed to have such wonderful and faithful staff. Through the ministry of RMI, we are currently employing over 35 Haitian nationals. Our desire is to continue to provide proper compensation for our staff which helps them care/provide for their families. We also need to hire more staff. We need administrators, translators and facilitators. As our ministry is faith based, we share this desire with you, our prayer partners and supporters. We are currently $4500/month short of our financial need. Please help our light shine even brighter in the fields of Haiti. How does this work? You login below and create an account and tell us how much you can do. Maybe it's $50/$75/$100 a month? Maybe less, maybe more! Special gifts are appreciated too. UPDATE: We've recently had several people join us! So far we've raised $429/monthly toward our goal. Are you able to help? Click below to donate monthly, or with a special gift. Choose "Haitian Staff".